As a kid, I was fascinated by things that glowed – twinkly holiday lights, my Lite-Brite screen with its brightly colored pegs, the moon. Fast-forward to today and not much has changed! I’m still enchanted by beautiful things that light up the night. 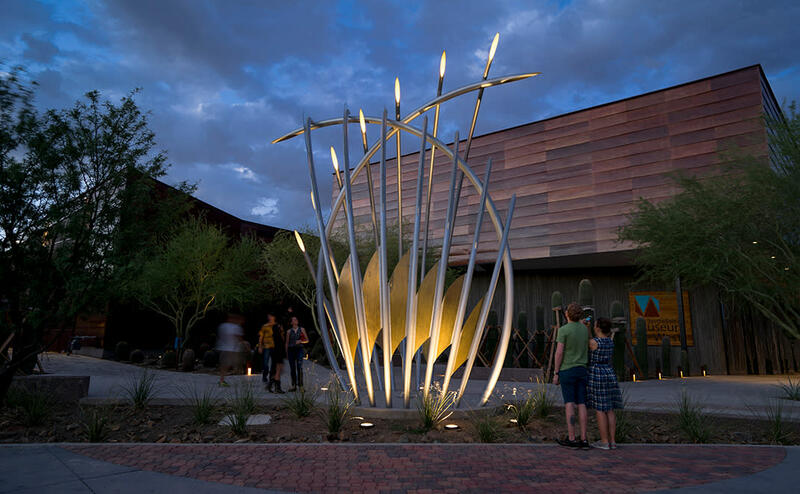 If you are too, don’t miss these seven Scottsdale Public Art installations that are magnificent any time of day, but take on an extra-special glow after dark. 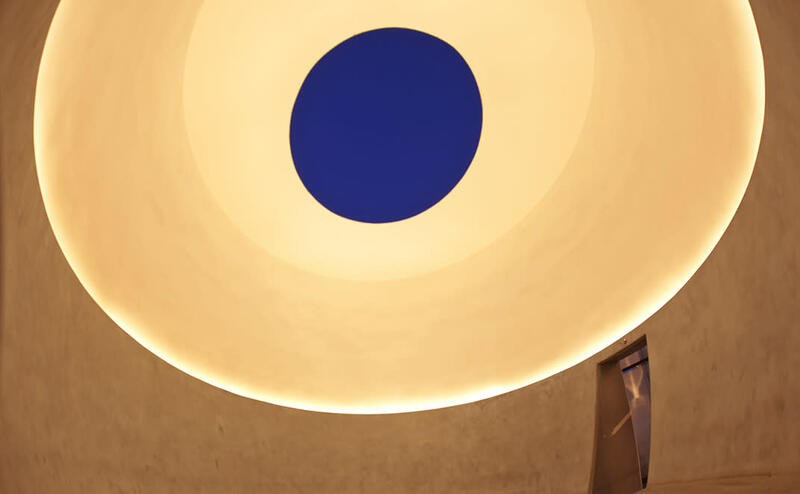 One of my longtime favorites, this monumental skyspace installation by James Turrell will change the way you look at the sky. Located at the Scottsdale Museum of Contemporary Art (SMoCA), Knight Rise frames the blue daytime sky in its elliptical opening, but the experience is entirely different at night when it embraces the darkened sky and focuses your attention on inky depths of the galaxy. Visit Knight Rise just before sunset on a Thursday, Friday or Saturday evening and experiencing the sky’s magical transition from color to darkness (SMoCA stays open until 8 p.m. these nights). You’ll find this gem by artist Curtis Pittman nestled by the southern exterior wall of Western Spirit: Scottsdale’s Museum of the West. During the day, Diamond Bloom’s brass panels and dichroic glass fins reflect the sun and cast multi-hued shadows, but at night this dynamic sculpture boasts colored lights that produce a striking purple and yellow glimmer reminiscent of the beautiful desert botanicals that were its inspiration. The gently undulating structure on the west side of Goldwater Boulevard, just north of the Arizona Canal, is more than a simple sound-abatement wall. Tributary Wall by artist Kevin Berry features several steel fish, ranging in size from nine to 18 feet long. At night, red and yellow lights make the fish glow with luminous color. Park across the street in the public garage and take a nighttime stroll along the sidewalk to see the fish up close. 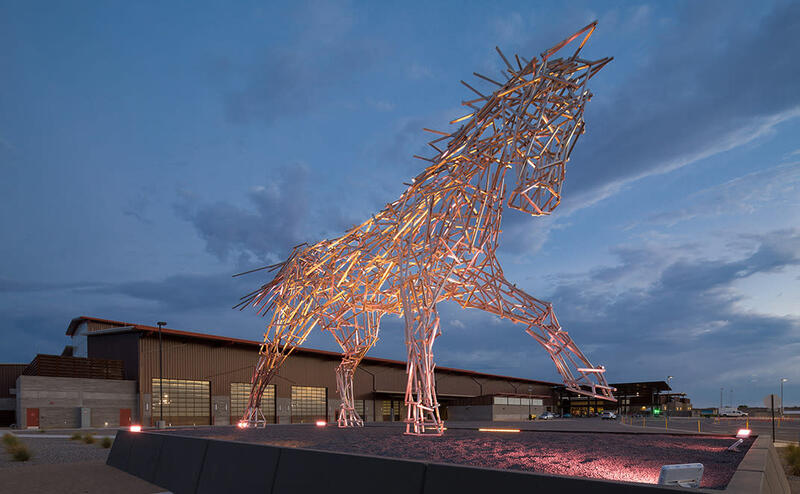 Jeff Zischke’s 24-foot-tall Impulsion at WestWorld is captivating in any light. But to truly appreciate this equestrian sculpture, formed from stainless-steel tubing, you must see it at night. That’s when LEDs mounted at the base of the elegant horse begin to shine and reflect off the stainless-steel structure, encapsulating the entire sculpture in a pinkish-purple glow. If you’re enjoying some nighttime dining or retail therapy at Scottsdale Quarter, don’t miss Joe O’Connell’s Lenses. 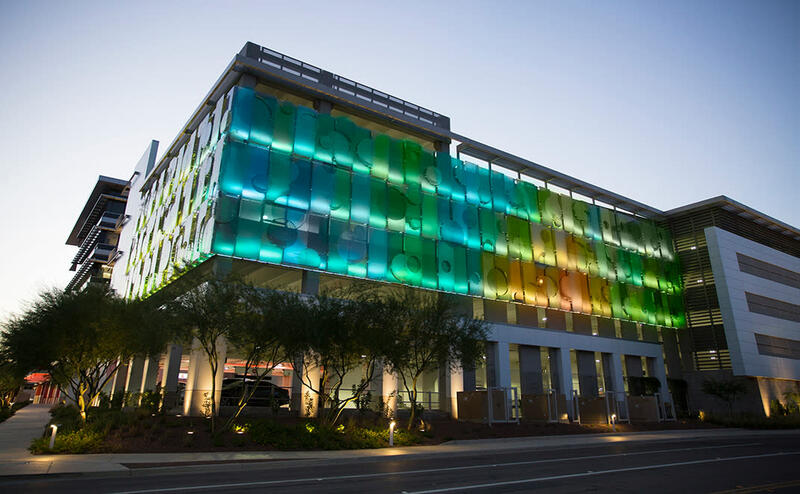 Based on the concept of optical lenses, this work features a pattern of cut polycarbonate panels that surround a parking structure on two sides in a lovely network of shape and color. The circular pattern transmits and reflects computer-operated LEDs, creating a rainbow of hues as the artwork pulls images into focus or blurs them into fields of color. 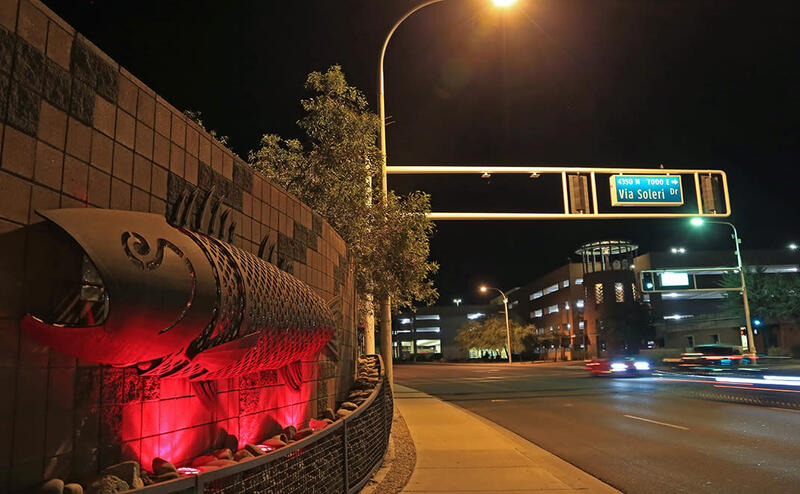 Every November public artworks sparkle at night along the Scottsdale Waterfront during Canal Convergence. 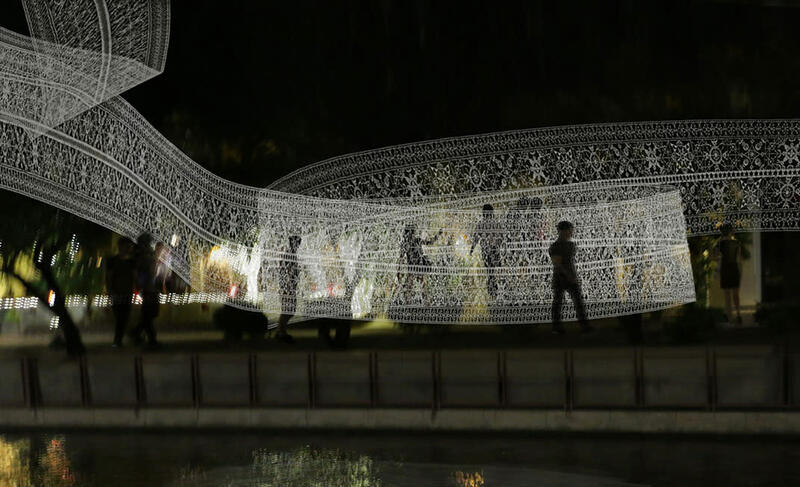 Several large-scale, light-based installations are featured, many of which are interactive and give you the opportunity to immerse yourself in art. This 10-evening event also features family-friendly activities, live entertainment and sustainability workshops.